It’s been said that adding plants to your living space is a great way to improve both the appearance of a room and your own personal well-being. But what if you’re really bad at keeping plants alive? Well, in that case, maybe a cactus will be good. They don’t need to be watered very much. 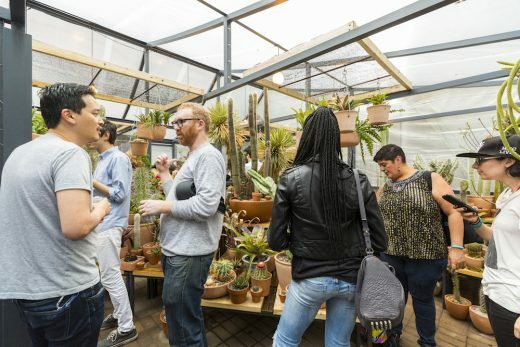 Plus, if you happen to be passing through the Lower East Side, you can browse a variety of Southern California cacti, now that The Cactus Store pop-up has returned to spend another summer near Seward Park. The Cactus Store (a cult favorite) was originally opened in Los Angeles’s Echo Park neighborhood, populating both homes and Instagram feeds with wacky plants aplenty. Though all the plants present came from Southern California, there are species native to the Canary Islands, Argentina, Angola, and elsewhere, totaling “approximately 600 specimens,” according to a press release. There will be more tropical plants this year, as well as a bamboo garden, T-shirts, and community programming. Will there be cactus “mutations” like at last year’s pop-up? I suppose it depends on how judgmental you want to be toward these prickled plants. Cactus Store NYC is fully stocked with strange plants and opens for the 2018 season tomorrow (6/2) 11am – 7pm 5 Essex st. The LES pop-up store, which officially opened on June 2, is presented in collaboration with DLJ Real Estate, a company developing a “boutique hotel” nearby at 9 Orchard Street. They purchased the building, which is the former site of the Jarmulowsky Bank Building, in 2011 for $33 million, according to The Real Deal. In addition to greenhouses and spiky plants, the area surrounding Seward Park has gotten some buzz as of late, with artist residencies being held in the park and Patricia Field’s new gallery/storefront located just nearby. Additionally, the Lo-Down reported that on June 12 the Seward Park Cooperative will vote on whether or not to grant developers Ascend and Optimum the area’s air rights, which encompass the landmarked Bialystoker nursing home. The Cactus Store is open Tuesday through Sunday at 5 Essex Street, 11 am to 7 pm.